New Directions Publishing Corporation, 9780811217224, 662pp. 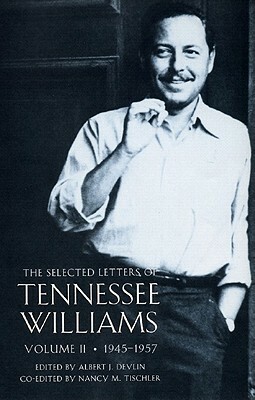 Volume I of "The Selected Letters of Tennessee Williams" ends with the surprise Broadway triumph of "The Glass Menagerie" in 1945. Volume II extends the correspondence from 1945 to 1957, a time of intense creativity for Williams, which saw the production of six major plays and several major film projects, especially the notorious "Baby Doll," which brought Williams and his main collaborator Elia Kazan into conflict with powerful agencies of censorship, revealing Williams' studied resistance to the forces of conformity. Letters written to Kazan, Carson McCullers, Gore Vidal, publisher James Laughlin, and Audrey Wood, Williams' resourceful agent, continue earlier lines of correspondence and introduce new celebrity figures. His Broadway and Hollywood successes vie with a string of personal losses and a deepening depression, making this period an emotional and artistic roller coaster. Through it all, his wit, aplomb, mischievousness, and wickedly keen eye for human idiosyncrasies make it clear why Gore Vidal, upon reading the letters, declared Williams "the most distinctive, humorous, American voice since Mark Twain.